What is the impact of automation--AI, Robotics, and analytics--on the supply chain professional? What is the feasibility of autonomous supply chain planning? And if we have automation taking over planning, what would the supply chain planning department look like? These topics are explored in this two-part series. In previous articles we had begun to explore AI and robotics and their impact on supply chains, based on changing business models and consumer lifestyles. This is a far-ranging topic with many diverse opinions about the benefits, limitations, scope, and risks of AI. We must continue the discussion in order to understand the technology and the applications and then explore what the impact will be on work and the supply chain “department” of the future. Without understanding, there is no ability to prepare and utilize what is good and manage the risk consequences. And for those who are looking ahead at their careers, it is always better to ride the waves than to be pulled under by the undertow. So, in this series we will cover AI and its impact on the supply chain office professional—specifically the role of planner. In the second installment we will cover the new Supply Chain planning department. When one passes through Boston’s Logan airport, one is confronted by the new ticketing area being adopted by many of the major airlines and airports—not just boarding-pass kiosks, but tag-your-bag kiosks. Now automation (plus a little more work on the customer’s part) assumes 95% to 100% of all the processes. Customers, by interacting with scanners, boarding-pass kiosks, and so on, can bypass all human interaction. Though not the most sophisticated, nor a thinking machine, it is one more step in the migration to more automation. And checkout? Mobile apps with your Amazon Go account transact the payment when you leave the store. If you are looking to pay with greenbacks or chat with people or examine each peach, you will have to shop somewhere else. In other countries these types of shopping scenarios are already in use. For example, in Korea, consumers can use their mobile device to scan the QR codes of items pictured on displays in subway stations, pay for them using the mobile device, and then have their order delivered when they arrive home. In China, over 400M people use Alipay (Alibaba). I recently shopped in Marks and Spencer in England where there were about ten self-checkout stations to one cashier. How do I get help in these new environments? Surely that is a role for people. No, there, too, sales associates will be fewer, as virtual assistants guide shoppers who have questions, or magic mirrors show you how you might look in something and also pop in the matching items to complete your outfit. Scanning at an in-store kiosk can tell you the price. And so it goes across the landscape. In our supply chain world, we have been enamored, for some time, with lights-out warehouses, automation, and robotic picking and manufacturing. So the broader adoption within the supply chain and into the actual customer world should come as no surprise. In fact, as we know, supply chain processes have been the biggest adopters of automation, IoT, and smarter computing for a long time. Is AI Inevitable and Is It Good? There are many diverse opinions about the goodness—or not—of a future with more AI, but one thing we can count on is that there will be more and more automation driven by AI in our future. The inevitability of this is driven by two simple facts. One is the economics of automation. One computer in the right application can do the work of many people. 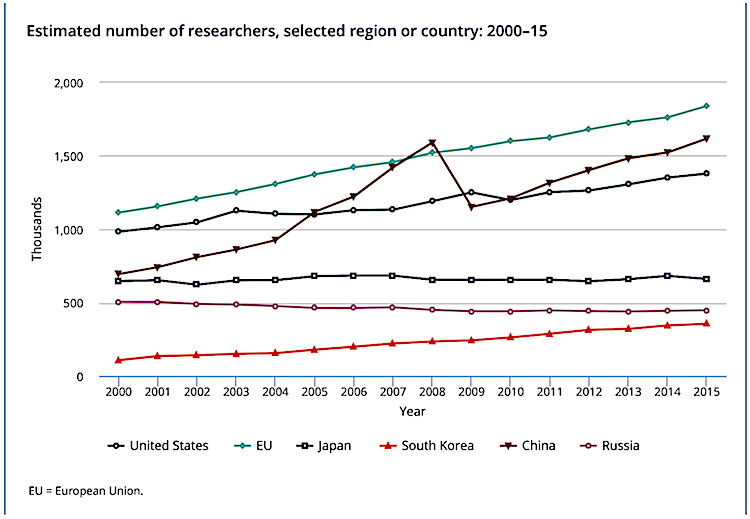 And secondly, the population of people involved in science and engineering research is exploding (see Figure 1), filling our world with software, devices, new life-science products and new methods of production. De facto, it is natural for humans to constantly seek new ideas and build new applications to replace the way things are done. Robotics and AI—the brains that power robots and so many applications today—are a major topic, from business journals and science magazines to consumer media outlets.4 The question is not if, but how much AI will rule our lives. Geoffrey Hinton, considered the father of AI, “believes political systems will use AI to ‘terrorize people.’ Hinton has petitioned against lethal autonomous weapons. Regarding existential risk from artificial intelligence, Hinton has stated that superintelligence seems more than 50 years away, but warns that ‘there is not a good track record of less intelligent things controlling things of greater intelligence.’ Asked in 2015 why he continues research despite his grave concerns, Hinton stated, ‘I could give you the usual arguments. But the truth is that the prospect of discovery is too sweet.’ Hinton has also stated that ‘It is very hard to predict beyond five years’ what advances AI will bring.”5 In 2017, Hinton argued that deep learning which has been useful but not good enough should be "thrown away" in favor of entirely new techniques. It is true, to date, that although searching appears to be easy, the information often gleaned is not terribly accurate, and is misleading or too cumbersome to systematize. A recent disturbing cover from The New Yorker Magazine gripped my attention. And the cover of the Economist was even more disturbing.6 It seems that the topic of AI is grabbing national attention and is also a worldwide concern as evidenced by the fact that it is a key topic of the World Economic Forum, what to say of this publication. Yet AI and the machines they master continue to increase. Though concerns stem from some different issues (AI errors/slip-ups,8 shrinking wages and the job market for many roles, and changing family and society behaviors), the main issues become where the innovation will take place, what those innovations will be, and the impact they will have on our future—as workers, as businesspeople, and as society. Clearly, we have some differences of opinion. Jeff Bezos insists that Amazon’s self-checkout will not reduce jobs, but just change them. It is true that behind the scenes all those hermetically sealed food containers need someone to pack them.9 But the human touch with customers is still lost. And my guess is that many of the tasks in food preparation will continue to erode with more automation. Stefanie Tellex of Brown University’s Humans to Robots Lab does worry about potential displacement, while continuing to develop robots that can perform more and more complex tasks. In an interesting survey done by MindEdge, titled ROBOMAGEDDON,11 MindEdge surveyed more than one thousand managers on the implementation of robots, artificial intelligence and automation, and the potential impact on the workforce. Their research found that “42 percent of managers believe the impact of robotics and automation in the workplace will result in the elimination of jobs” and that gloomily, over 52% of the employees lack the skills12 to operate in a new work environment. Those results could imply that companies will seek more automation because people can’t perform, leading to even more job loss and/or stymied effectiveness due to the lack of ability to take advantage of all the information and automation that is—and will be—at the fingertips. The prevailing notion is that robots need human directions to understand what to do. And then, by repetition, they can perform tasks—what cognitive computer scientists might call reinforcement learning. However, that is changing, say many developers who are developing so-called learning robots. Robots are emerging that will be more dynamic and lifelike in their cognition and ability to play more human roles. Ultimately and eerily, robots will become their own decision makers, not needing task directions and/or will be able to filter irrelevant data and assess past unsuccessful approaches. Connected to the net and using deep search and analytical methods based on AI and neural networks,14 robots will develop moves and decisions, sometimes with great originality, all on their own. As well, robots are clearly lacking in social skills and human traits such as creativity and intuition. As you can see from conversations people “have” with robots, they are only capable, today, of responding with what they have been programmed to say or do. 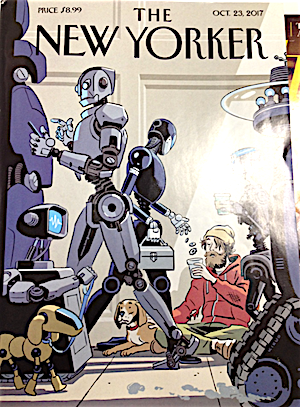 In a recent cover story in Scientific American, an article, “Self-Taught Robots,” caught my attention. The notion here is that AI-driven machines using neural networks can learn, spontaneously, to understand when their assumptions are right or wrong and learn to do better in assessing data and making predictions over time. Sounds like a planner, right? Neural net programmers know this and rely on this to build better and better analytics over time. (In the next installment of this series we will cover the discussion we had with developers who have AI solutions.) However, success or failure of the model is often decided by their human partner. That, too, will change as more powerful analytics and complex event processors filter masses of data and assess the results of decisions, events, and actions: that forecast was off by 10%, or an event did not happen in the sequence or timing predicted. Today, neural nets are beginning to be able to analyze more of the sensory and visual world. This ability plus the access to vast quantities of data which they can access and analyze at lightning speed may put them at an advantage in time over humans—or so the argument goes. Just envision huge streams of video facial analyses of customers looking at products, with analytics determining likes and dislikes, or using video or sensors to analyze and detect a bruise on a peach and discard it from a customer’s order, or many other such examples that combine sensory and traditional data (numbers, forecasts, temperatures, miles, and so on). If one thinks about the impact of this, one can extrapolate to the tasks and jobs, such as planning, that we thought were off limits to AI. Already, analytics are replacing bankers and financial advisors, at some level, helping to select investments based on a variety of goals an investor may have. Most product planners and marketers do rely on technology, but they also insist it is the technology plus their higher level intuitive skills that make them excel at their jobs. However, data from Daniel Kahneman, author of Thinking, Fast and Slow, challenges the notion. He says that our intuition can be highly error prone and that other evidentiary systems can best our biased thinking. That is nineteenth century language. But what he is saying is that people in discourse can be original and creative and unfettered and that their thoughts can be as limitless as the universe itself. Robots don’t know how to respond to “limitless.” The robot can only succeed within certain confines of operation. That is pretty ordinary code: programmed “if, then, else” statements in Cobol, JAVA or C++. So, can a planner then be replaced by a machine? We will discuss the specific effects on supply chain “office jobs” in the next installment. A note: As we proceed forward in this series I do want to state that personally, I am in the caution camp. I am not an advocate of a cold future with technology-infused homes and our lives splashed all over social media, a future in which we are no longer the consumers of technology but are being consumed by it. I happen to like people a great deal. A future with HAL is not at all appealing to me. He’s not warm and fun, though my own prediction is that the nuclear family will have robots as members in the near future. We are already seeing this in high-tech societies. Additional societal problems exist with the thinking skills and health of people who are addicted to technology. The Center for Humane Technology, which was founded by former Google and Facebook folks, has a position that our society is being hijacked by technology.18 Specifically, about AI, their insider’s perspective is that social networks like Facebook, Google, et al, use AI to particularize messages and media to keep you hooked and coming for more—and much of the “more” is advertising, outrageous content, and visual content that divides us and stresses us. So thinking about how to embrace change and design the jobs of the future for the supply chain department of the future will be discussed in Part Two. BBC: How may I help you?